Chicago - Wilson and their [K] Factor technology made its presence known in nearly every Wimbledon Championship match for another year. Wilson players dominated Wimbledon, had 11 players in the finals and capturing 6 out of 9 titles: Men’s Doubles, Women’s Singles, Women’s Doubles, Junior Girls’ Singles, Junior Girls’ Doubles, and Junior Boys’ Doubles. They all featured [K] Factor rackets in the hands of Wilson’s top players. 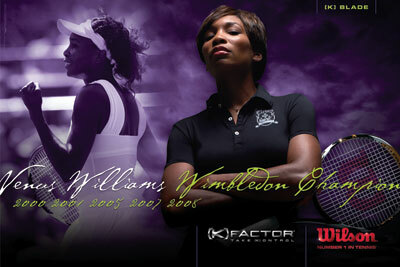 In the Women’s Singles final, Venus Williams won her 5th Wimbledon title and earned the 7th Grand Slam of her career playing the [K] Blade Team racket, along with Wilson string and Wilson’s unique black and gold racket bag. In a straight set match over her sister Serena, who also plays the [K]Blade Team racket, Venus came out ahead 7-5 6-4. Venus also made history at this year’s Wimbledon with a 129 mph serve, a new Wimbledon record. Shortly after their singles final, Venus & Serena took their [K] Blade rackets and played in the women’s championship doubles final, and went on to dominate to take the doubles title 6-2, 6-2. “I felt confident and strong throughout the tournament, secure in both my game and in my Wilson products - my [K] Blade racket, Wilson bag, and Wilson string - supported me through every match on my road to victory” Venus said. Wilson is proud to provide both sisters with equipment to help them live out their dreams. After a thrilling 4 hour and 48 minute battle, Roger Federer lost the Men’s Singles title to Rafael Nadal 6-4, 6-4, 6-7 (5-7), 6-7 (8-10), 9-7. Federer, with his [K] Six.One Tour, was down after the first 2 sets and after a lengthy rain delay, came back with 2 sets of his own. In the end, Nadal won after an excruciating fifth set. [K] Factor was also dominate in Men’s Doubles, as Daniel Nestor, using his [K] Six.One 95, and Neand Zimonjic took the title against Jonas Bjorkman and Kevin Ullyett, both also playing Wilson’s [K] Six.One, 7-6(14-12), 6-7(3-7), 6-3, 6-3. This title not only pushes Nestor to #1 in the world but it completes a career Slam for Nestor with titles at the ’02 Australian Open, ’04 US Open, ’07 French Open, and now ’08 Wimbledon. In Junior Girls’ Singles, Laura Robson won the title, 6-3, 3-6, 6-1, playing with a [K] Blade 98. Polana Hercqog, used her [K] Blade Tour in her Junior Girls’ Doubles title match and won 6-3, 1-6, 6-2. And in Junior Boys’ Doubles, Tsung Hua Yang captured the title with his [K] Blade Tour 6-4, 2-6, 12-10. Wilson’s [K] Factor rackets continue as the top selling technology worldwide and Wilson’s player results at Wimbledon continues to reflect Wilson as the #1 brand in tennis.